A feve- a little china figure is hidden inside of the cake, and whoever gets it, (without breaking a cap when biting into it) is crowned king and gets to choose his queen. 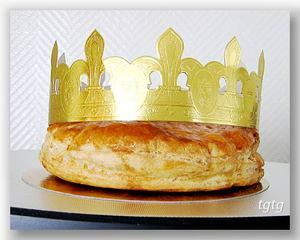 The cake is usually sold with a gold paper crown (I suspect if Hermes or Vuitton sells the cake, a real crown is provided). 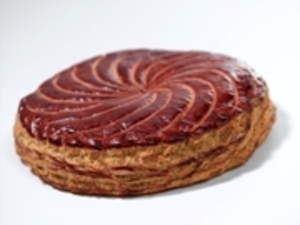 Pierre Herme, one of the top pastry chefs in Paris, is doing a variation on a theme with a galette of chocolate ganache and also one of almond paste, lychees, and raspberries (pictured below). Eye Prefer Paris tours is getting into the January sale spirit. We are offering a 15 euro discount on all January tours, and tours will be 160 euros instead of 175 euros. If there was ever a reason to come to Paris, this is it. Look forward to seeing you this month. Below is my 7 Best Reasons to Visit Paris article again. 1.Airfares are cheap- You can fly from most major U.S. cities for under $500. 2.Reduced hotel rates - It’s off-season, so hotels are 20-40% less. Sometimes the 5 star hotels have special winter packages, so if you’ve ever fantasized about that suite at the Ritz, January is your best bet.Click on this link for January discounts on Marais hotels. 4. Winter sales- The official Paris winter 2008 sale starts Wednesday January 9th. With reductions from 30 to 60% off, you better get up early and put on your running shoes. 5. Museums & attractions are manageable- The holiday crowds are gone and you may be able to see Mona’s smile from less than 100 feet away or get to the top of Eiffel Tower without wasting the entire day. 6. Weather is decent- There’s not much sunshine but it doesn’t rain or snow very much. The daytime temperatures range between 35 and 40 degrees Fahrenheit, so just pack a warm coat and scarf and you’re in business. 7. Best reason of all- A 15 euro discount on an Eye Prefer Paris Tour. My tours will be 160 euros instead 175 euros for the month of January. Now if this doesn’t have you book a flight to Paris toute de suite, I don’t know what will. 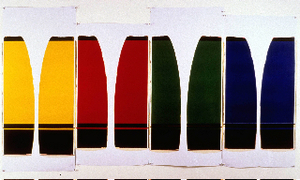 Don’t miss American artist Ellen Carey’s magnificent and unique photographic works. Using a 24X20 inch Polaroid camera, she creates one of a kind minimalist abstract color photos with saturated color and pure forms. The show is a collaboration of Jayne H. Baum of JHB Gallery New York and Ibu Gallery Paris. 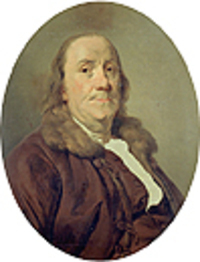 Ben Franklin was a Paris bon vivant amongst his other illustrious accomplishments. This eye opening new exhibit is a rare look at how influential he was to our history and culture. 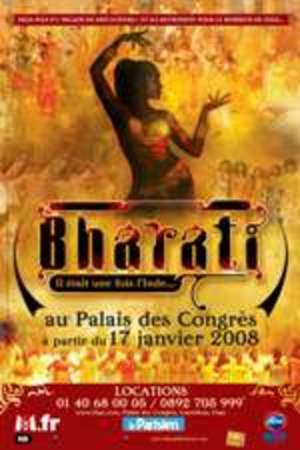 Bahrati, a Bollywood extravaganza with over 70 artists and 800 costumes, is back in Paris after a sold-out run in 2005. A soundtrack of popular Indian movie songs, a giant screen projecting breathtaking landscapes, and martial arts acrobats all come together to tell this beautiful and colorful love story. Bharati, Once upon a time in India. PALAIS DES CONGRES DE PARIS. 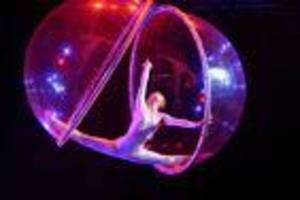 Over 30 acts of circus artists, clowns, and acrobats from China, Ukraine, Canada, Germany, U.S., UK and Morocco compete for the gold at the Cirque du Phenix. Also a tribute to the French circus will be included in the festivities.